Muslim Youth Leadership Awards (MYLA) receives donations every year from generous donors like you to fund scholarships for full-time college students. Over the past decade, MYLA has awarded more than $300,000 in scholarships. MYLA’s vision is to be among the most prestigious scholarships college students from our community aspire to receive. 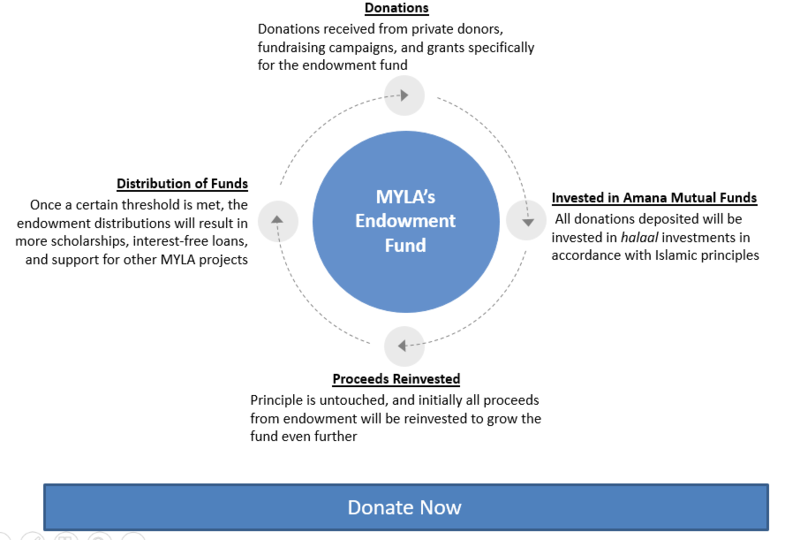 In August 2013, MYLA started a new long-term initiative, a scholarship endowment fund, to help MYLA achieve self-sufficiency and secure a permanent source of scholarships for students from our community. The endowment fund will work like an Islamic trust (waqf), in which the money deposited will be invested in halal investments in accordance with Islamic principles. The income generated from those investments will be used toward awarding scholarships. Any donations made to this fund will have to be explicitly specified as such, otherwise the money will be used for annual MYLA scholarships. The principal will never be used toward any scholarship awards. Instead, it will only be dedicated for investment in Islamic mutual funds. All donations will be invested in Amana Mutual Funds (www.amanafunds.com). The establishment of this endowment fund is analogous to building an orchard of fruit trees. Once enough trees have been planted, they will bear enough fruit year after year to nourish the people of a community. Similarly, the money in endowment fund will grow year after year insha Allah, and provide a self-sustaining source of funds for scholarships for the students in our community. We hope at a certain point that the bulk of all our scholarships will be generated from endowment income, helping more and more students on an annual basis. Every dollar donated to this endowment fund will translate into many more dollars over your lifetime and beyond, and will continue supporting highly deserving and motivated students in their quest for higher education. Thus, it is an excellent opportunity for sadaqa-e-jaariyah. Please do not let this opportunity slip by without taking advantage of it. There are many ways by which you can donate. Please specify whether your donation is for the endowment or general Fund.